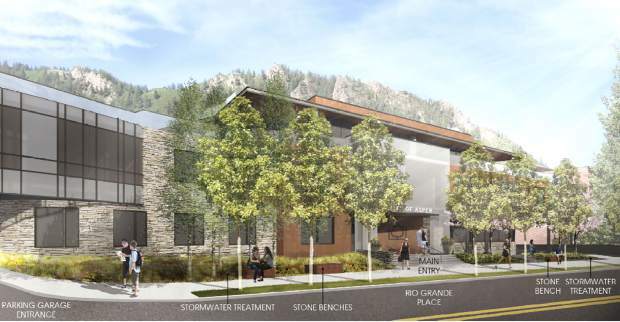 A new rendering of the proposed city offices, as a shown from the Rio Grande Place entrance, won over members of Aspen City Council at their Monday meeting. 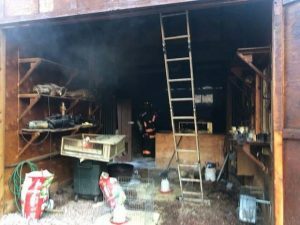 Attorneys on both sides of a lawsuit aimed at the city of Aspen convened Wednesday to discuss the status of the case. A timeline also was set that affects the future of a 37,000-square-foot office building being built. 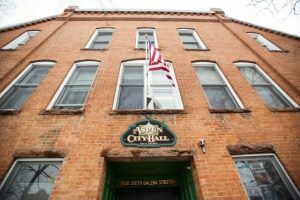 It’s the result of a status conference that was held concerning two lawsuits levied by three area residents over Aspen City Council’s approval of a municipal building last April. 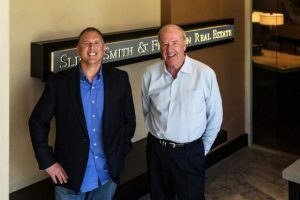 City Attorney Jim True, along with an outside attorney for the local government, Boulder-based Josh Marks, as well as Denver lawyer J.D. 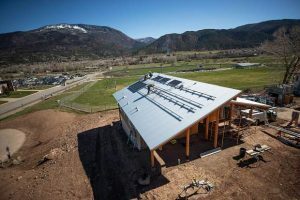 Porter, representing Snowmass Canyon resident Toni Kronberg and Aspen residents Marica Goshorn and Steve Goldenberg, discussed the case over the phone with 9th Judicial District Court Judge John Neiley. True said the judge told the group he expects to rule within the next month on the city’s motion to reconsider his Jan. 30 ruling. True also has asked for the court to dismiss the case. Goldenberg and Goshorn sued the city after they were denied putting a referendum to voters last May. The City Clerk’s Office said they did not get the adequate number of signatures for their petition in the required timeframe. The petitioners argued they were denied an extra day per the Home Rule Charter. But at the crux of the legal argument is how the council made its decision. In his ruling, Neiley determined that council’s decision was “legislative” and therefore subject to a citizen referendum. The city had previously filed a motion to dismiss, contending that council’s approval of a new office building was “administrative” and therefore not subject to a referendum. Neiley ruled against the city’s motion to dismiss. “We were very happy with the judge’s initial ruling,” Porter said. There are pending motions and briefs that need to be considered by the court, which is making the case even more complex. On Wednesday, Porter filed what is known as a “supplemental authority for response,” which now prompts True to have to file a reply. Once that is done, the judge can consider the reconsideration motion. Meanwhile, crews were to begin this month preparing the site for construction. The new building would replace the old Aspen Chamber Resort Association next to the Rio Grande parking garage. The project is on hold until the legal matter is settled.